With Salem being South India’s fastest growing cities and an important trucking centre, the new dealership is strategically located to provide customers with a complete 3S experience of Sales, Service and Spare Parts. Spread over 31,000 square feet, with highly trained manpower and sophisticated tools for faster turnaround, for both sales and service, the facility would fulfil its customers need at a single location. Having recently celebrated 60 years of truck manufacturing at its first manufacturing and engineering facility in Jamshedpur, Tata Motors is today the leader in the Indian commercial vehicle space, with the most comprehensive line-up of commercial vehicles, ranging from the 0.5 tonne Magic Iris and Ace Zip to the 49 tonne PRIMA Heavy Commercial Vehicle. At Tata Motors’ new dealerships in Salem, customers can experience a host of primary and value-added services for Tata Motors’ entire range of commercial vehicles, through trained personnel. This new showroom in Salem, offers a contemporary-styled, single-point hub for Sales, Service and Spare Parts and is spacious, for a comfortable buying experience. The service facility can attend up to 26 vehicles per day, with the workshop spread over an area of 22,500 square feet. At the new dealership, customers can also avail of Tata Motors innovative service offerings for its medium & heavy commercial vehicle range like Tata Alert, Tata Fleetman, Triple Benefit Insurance, Tata Motors 4 year warranty and Extended Service Intervals. The dealership is also equipped with mobile workshops for 24X7 customer support. Furthermore customers can also avail of financing options, loyalty programs, including full service contracts for an enhanced service experience. 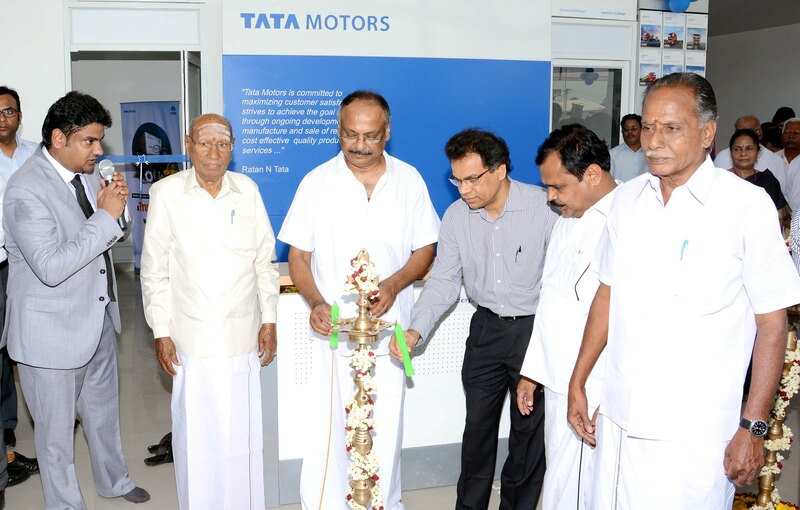 To ensure best service experience, the entire sales team at the new dealership in SALEM have been trained under Tata Motors coveted DRONA training module, which comprises rich training content by specialists. Additionally the dealership also has a resting facility for drivers.